Zelda Jeffers appeared at Bedford Magistrates Court on Monday November 2nd. 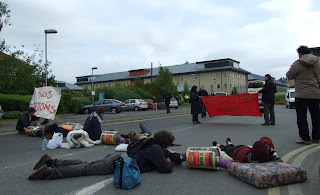 She was sentenced to 16 days in prison for refusing to pay a fine of £450 for her part in blockading Yarlswood Immigration Detention Centre on the day of a charter flight to Nigeria. The joint charter flight that was meant to carry several families to Lagos via Dublin on July 30th this year was delayed for several hours due to the blockade by the Stop Deportation Network and deportees'refusing to board the plane. Around 1:30pm, as the Yarl's Wood deportees were being put on the coaches to be taken to the airport, supporters and campaigners from the Stop Deportation Network started a demonstration outside, blocking the only way out of the centre. The protest lasted until about 4:30pm, when it was removed by police and the coaches left immediately afterwards. Zelda was arrested while sitting in the road to try and stop the coaches leaving. Zelda has been sent to HMP Peterborough.